Winemaker Zhang Jing from winery Helan Qing Xue in Ningxia headed to Australia earlier this year for a three-month working holiday. She spent two months at Yering Station in the Yarra Valley and visited Hewitson and Orlando in the Barossa Valley and Chapel Hill in McLaren Vale. 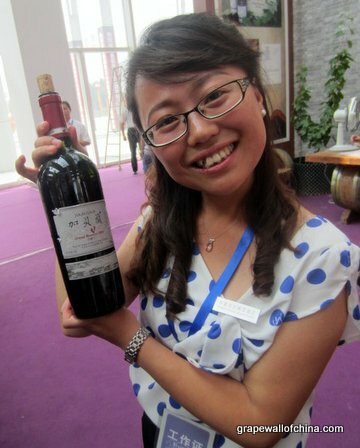 I recently met her to talk about the trip, the newly released entry-level Jia Bei Lan 2011 and trends in wine-making in China. We had a great vintage at Helan Qing Xue in 2009, but in 2010 we had a small vintage because of too much rain at harvest. For the 2011 vintage, we wanted to make fruitier wine. Bud break was normal, we had a very dry and hot summer, and we delayed harvest one week later than in 2010. We have seen some winemakers in China go through a process. Ten years ago, they used fewer barrels and the wine was light and simple. In the last five years, they paid more attention to aging wine, to creating a stronger structure, deeper color and richer aroma, so they used more barrels. Now, more winemakers want a better balance between the fruit and oak. I prefer wine that is fruitier, more elegant, more like a Burgundy style even if the grapes are not the same. I don’t want too many tannins, too much bitterness. Ningxia is influenced by France. We are influenced by some famous chateaux, like Latour and Lafite, that use 100 percent new oak for their top wines. They can do it because they have good fruit. We don’t have that kind of fruit and we want to keep things balanced. Some winemakers have already changed their minds about the idea the best wine is automatically done in 100 percent new oak. In Ningxia, we are now using more combinations of barrels, both new oak and old oak. Every winemaker in Australia was so serious. They are patient and have a strong sense of responsibility. It is not only a job, to make a living, but also their love. Willy Lun of Yering Station influenced me in many ways. I found he did everything in the winery. He told me he’s washed barrels and tanks a thousand times. He didn’t think it was hard or boring. I thought a lot about the job of the winemaker. Sometimes in China, we put the winemaker in a high position, we make them a very important person. They do an increasing amount of work in the office, not in the winery. But a winemaker should first be a good farmer. They should also be a good mechanic, be organized to balance all of the tasks in the winery, and be able to explain their wine to consumers, to promote it. We can’t take Australian methods directly to Ningxia because we have a different climate and different grape varieties. But the trip gave me some new views. In the field, almost everything is done by machine. Pruning, spraying, harvesting. Australians pay more attention to costs, to keeping a balance. They are very organized in Australia. With their SOP [standard operating procedure], everyone knew what to do. This is something we should learn. Also, in the winery, they always use a forklift. I can now use a forklift, too, although someone said, “Your singing is better than your driving”! The trip also made me think about the wine industry in general. In Ningxia, if I want to have a winery, I think I should build a big chateau first. In Australia, you can just make wine or open a cellar door. 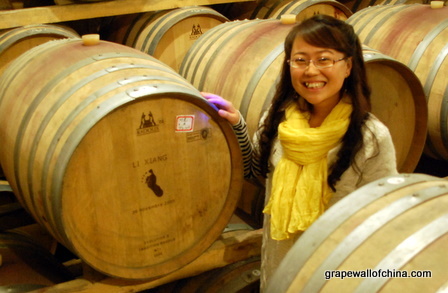 Wine maker Zhang Jing in the cellar at Helan Qing Xue.